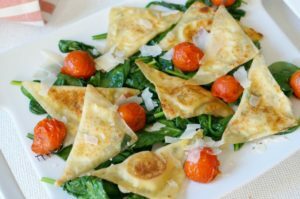 This Toasted Wonton Ravioli recipe is a great date-night-in recipe! 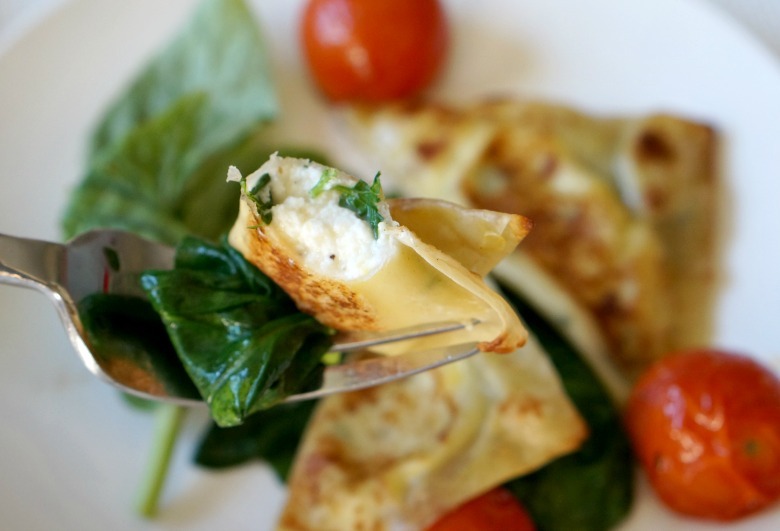 Skip the labor of making pasta and use wonton wrappers instead. I used to have a ravioli press. I used to make homemade pasta for fun. I used to have a to have a lot of extra time. Let’s be honest… homemade pasta is amazing. But, who’s got that kind of time? And ravioli? Well. 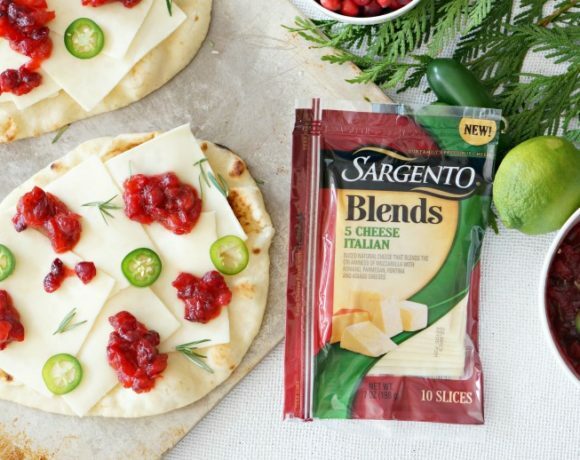 I don’t know about you, but I am not an expert ravioli stuffer. Yeah, that sounded less weird in my head. 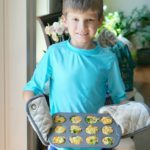 I’m loving this Toasted Wonton Ravioli recipe. 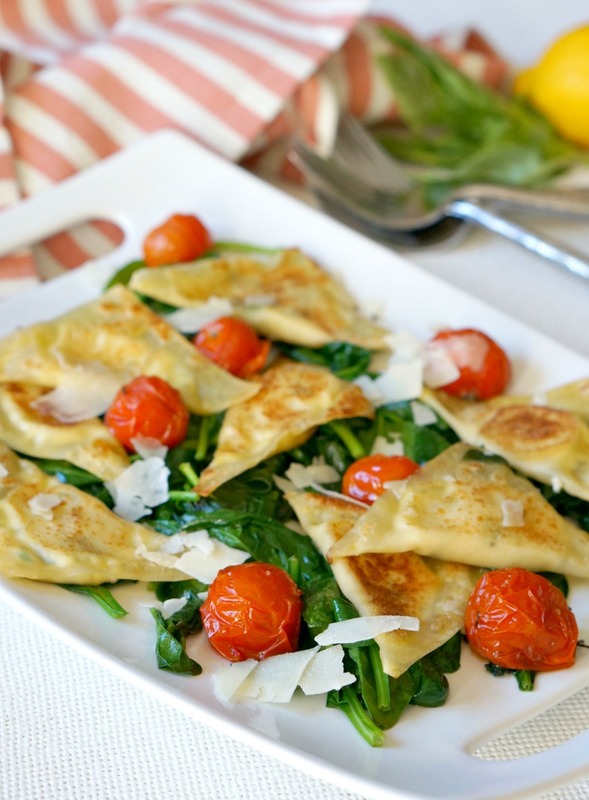 Using the wonton wrappers lets us skip that whole “making pasta” bit. And toasting them? That’s the most genius part. By not tossing them in a boiling water, we don’t have to worry about cheese leaking out or water seeping into broken pasta seals. Preheat the oven to 425 degrees Fahrenheit. 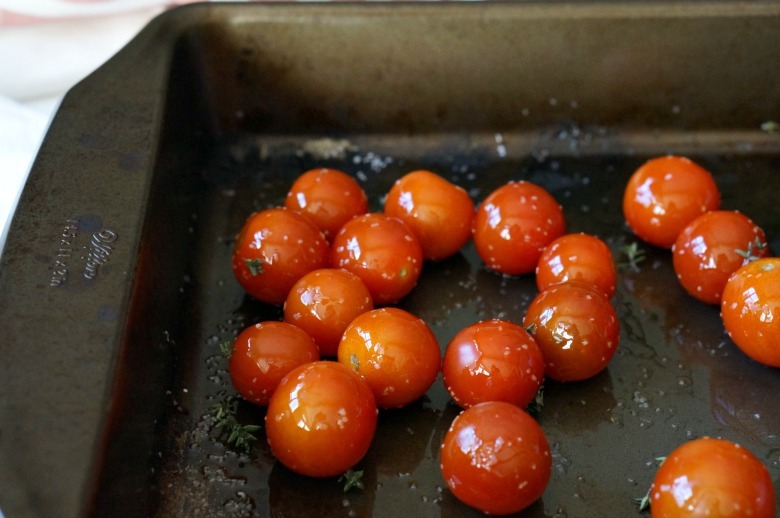 On a rimmed baking sheet toss tomatoes with olive oil, salt and pepper. Bake until bursting, about 15-20 minutes. 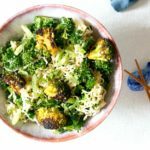 In a medium bowl, combine the ricotta, basil, parsley, salt, pepper and lemon zest. Lay out 16 wonton wrappers and dollop a tablespoon (or less!) of the ricotta mixture in the middle of each wonton. Brush the edges of the wrapper with egg, then press the edges to seal. I used a fork to make sure they were sealed pretty well. Heat a large skillet over medium high. Spray generously with cooking spray. Lay eight ravioli in the skillet. Cook on each side, about 3-4 minutes or until golden. Pour in 2 Tb. of water and cover. 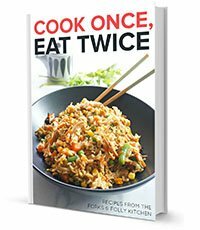 Cook for another 2-3 minutes, or until water evaporates. Remove to a serving tray and repeat with the remaining ravioli. Meanwhile, pour 1 Tb. olive oil into a second skillet over medium-high heat. 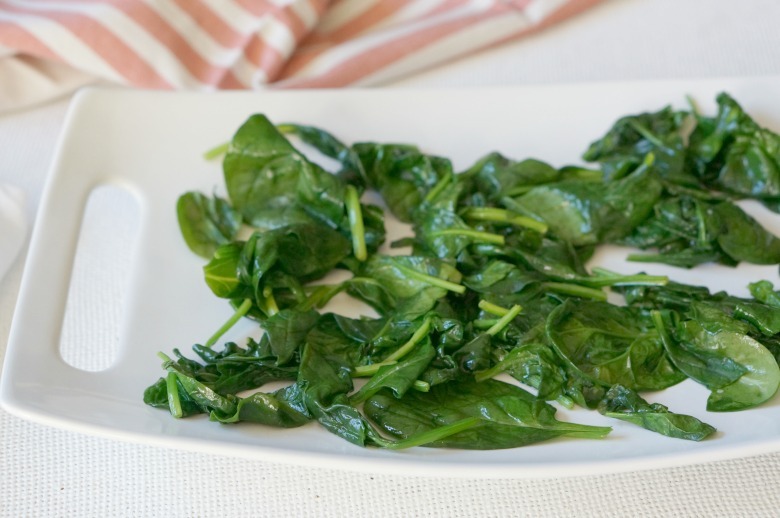 Add in the spinach and season with salt and pepper. Cook until wilted, tossing constantly, about 3-4 minutes. 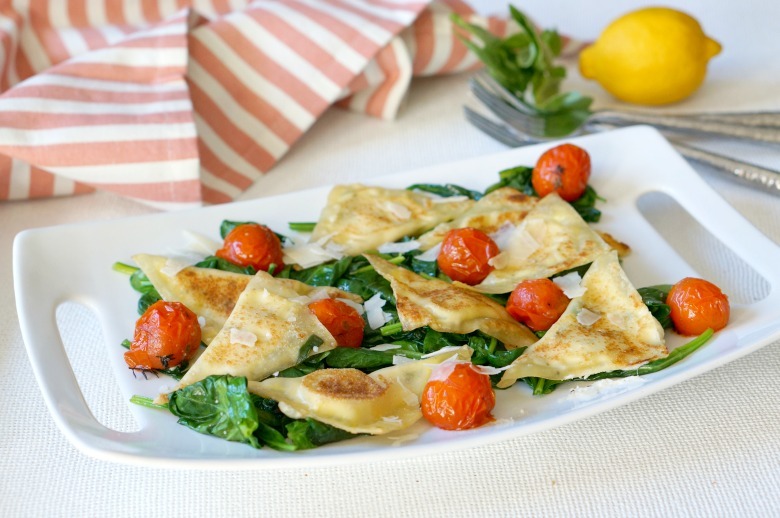 On the serving dish, layer the cooked spinach, toasted raviolis, roasted tomatoes, and garnish with grated Parmesan. 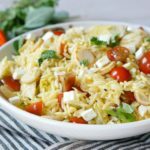 Serve with a bottle of your favorite wine! 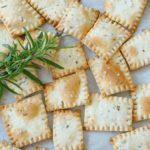 This Toasted Wonton Ravioli recipe is a great date-night in recipe! Skip the labor of making pasta and use wonton wrappers instead. Preheat the oven to 425 degrees Fahrenheit. On a rimmed baking sheet toss tomatoes with 1 Tb. olive oil, salt and pepper. Bake until bursting, about 15-20 minutes. 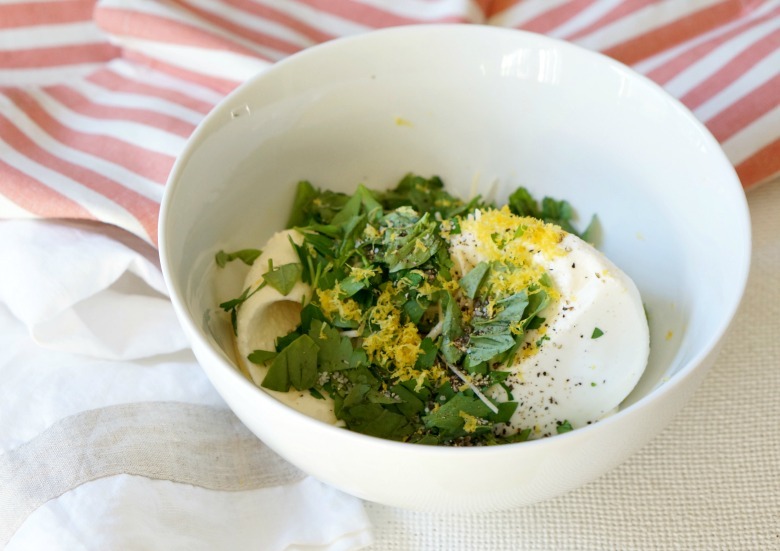 In a medium bowl, combine the ricotta, basil, parsley, salt, pepper and lemon zest. 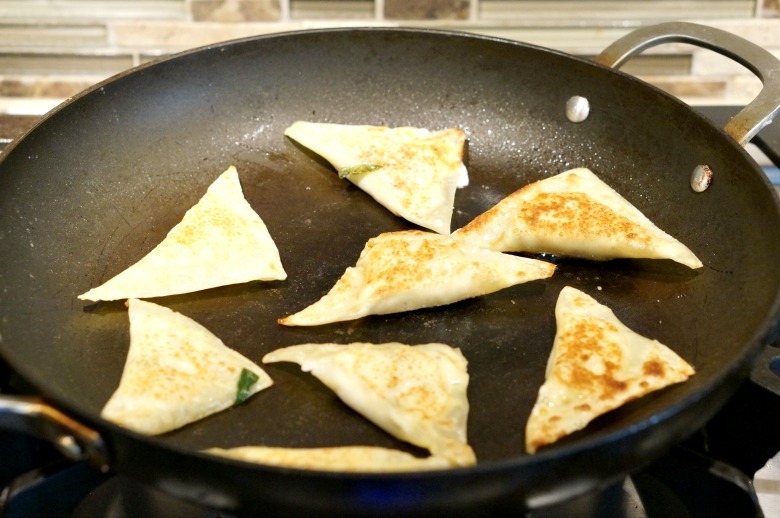 Lay out the wonton wrappers and dollop a tablespoon (or less!) of the ricotta mixture in the middle of each wonton. Brush the edges of the wrapper with egg, then press the edges to seal. I used a fork to make sure they were sealed pretty well. Heat a large skillet over medium high. Spray generously with cooking spray. Lay 8 ravioli in the skillet. Cook on each side, about 3-4 minutes or until golden. Pour in 2 Tb. of water and cover. Cook for another 2-3 minutes, or until water evaporates. Remove to a serving tray and repeat with the remaining ravioli. 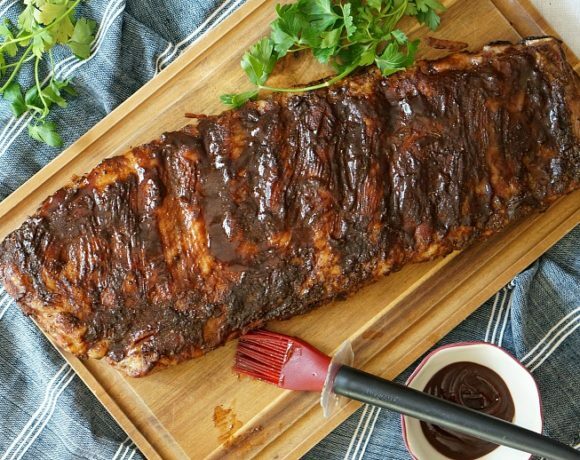 If you’re looking for a few other date night ideas, try this recipe for classic Sheet Pan Steak Frites, honeymoon-inspired Ligurian Pasta Genovese, or this easy Grilled Pork Tenderloin.